Have a question about what one of our data series means? Want to discuss unusual chart activity that wasn’t covered in our weekly Supply and Demand Report? Leave a comment below and we, or our passionate subscribers, will endavour to answer it. We also welcome error spotting. While we have applied unconventional proprietary techniques to clean up over a terabyte of data, we aren’t infallible so we may miss errors in the source data or our algorithms may not have considered new corner cases. We are constantly refining our data processing systems and welcome your input. Our charts are based on a licensed database from Thomson Reuters of time-stamped bid and offer tick data for both spot and futures markets, for the entire trading day. To that we have applied unconventional proprietary techniques to filter the raw data, which can contain glitches, reflect temporary or even ephemeral conditions in the real world and spurious noise, to reveal the full information content of the underlying signals. You can read more about our methodology here. Note that the Monetary Metals® GOFO and SIFO rates, and lease rates derived from them, are indicative only. The high correlation of Monetary Metals’ rates to the LBMA’s means that they are useful as a reference point for the direction of forward and lease rates, rather than as absolute executable rates. Our three month time period charts show our actual underlying data but we have applied a 5 day moving average to our data in the three year and max time period charts to make it visually easier to read. 1. Elaborate somewhere on when and how frequently you update the charts. Now it’s Tuesday but Mondays charts are still missing. 2. The resuloution is way too low. Reading axix text is sometimes difficult. The charts update on or before 6am AZ time. They are one day behind. The chart contains a legend indicating the date of the most recent data it contains. For the last two weeks the charts update with a lag of two to five days. I have never seen the lag you claim. As I write Wednesdays charts are showing in my browser. It shouldn’t be too difficult to add a Cron job on the server so you achieve timely updates. Must be a recent website glitch. I remember seeing the Friday July 7 gold/silver basis numbers in the chart when I checked on Monday. Maybe the data is being corrected manually and a re-updated chart is coming? Thanks for letting us know, it must be a cache issue, I’m getting out IT guy to look at it. At the backend our charts are all of the same date. The fundamental price increased by some 90 USD over the last two days. That is an enormous increase, bigger than anything I have seen before. Could you explain what factors are behind the move as I cannot see any obvious major changes to the market over the last few days that motivate such a major move. 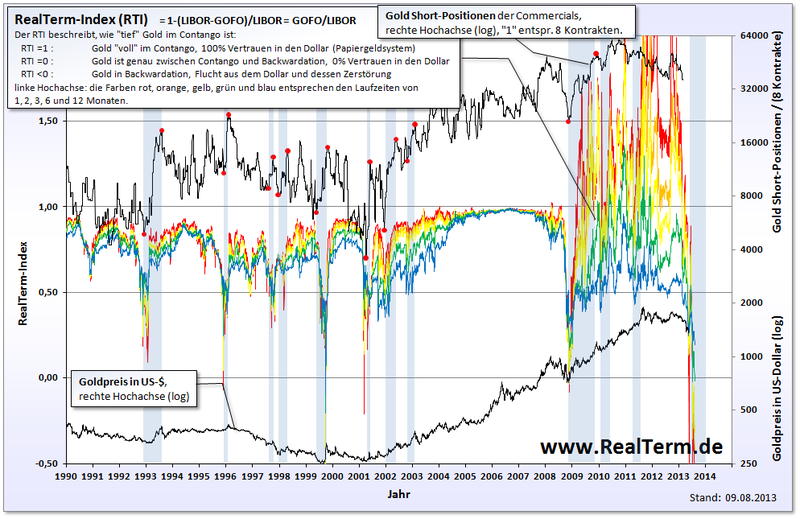 The pattern of GOFO and gold basis are very similiar to LIBOR, in fact only the deviation(!) from LIBOR ist of interest, but is not visualized by these charts. Lease Rate of gold is more interesting, but also only of real interest in comparison to LIBOR. For example, if Lease Rate > LIBOR, then Gold ist in backwardation. RTI1 should theoretically be impossible, but ist isn´t, so it´s an artefact. should theoretically be impossible, but ist isn´t, so it´s an artefact. As you can see in this graph, the calculated RTI-Index=GOFO/LIBOR indicates future price moves of gold and it would be veryinteresting, if it also worked the last 4 years in an (almost) zero-interest environment. Question: Is there a gold futures market under Maduro and the Bolivar? How do you splice together all individual futures contracts? Do you somehow weight Open Interest or you use another method? We don’t use Open Interest, as mentioned in https://monetary-metals.com/data-science-charts/about-forward-rates/ our software “looks at forward spreads for all contracts. From these discrete spreads, it calculates a single continuous constant-maturity forward spread”. So are you splicing daily readings from the one year out contract? You obviously can’t be splicing daily readings from the near term contract due to the trend toward temporary backwardation. We don’t use just the one year out contract, we look at spot plus all the futures contracts and then use a proprietary method to convert those prices into a continuous rate. Splicing doesn’t work. You need a more sophisticated mathematical method to keep a constant-duration basis. The graph legends obscure the early data in several of the basis charts.